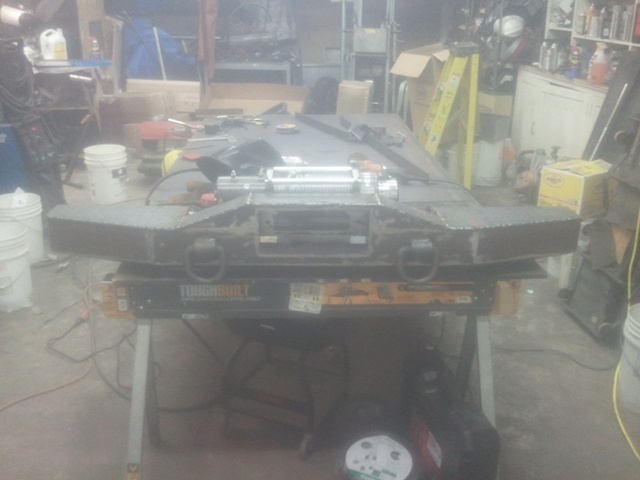 After creating the rear bumper, I needed to create the front. Just like the rear bumper, I needed it to be strong. Unlike the rear bumper, I also need the front to be light and include a winch mount. Another thing that differs from the rear bumper is the complexity. There are several angles in this bumper and there isn’t a frame. It is only built using a C channel and plate steel. I also remembered to take more pictures, so hopefully this will be an easier read. The picture above shows one of many cad drawings. I used a free version of Cadstd and Google sketchup to design it. 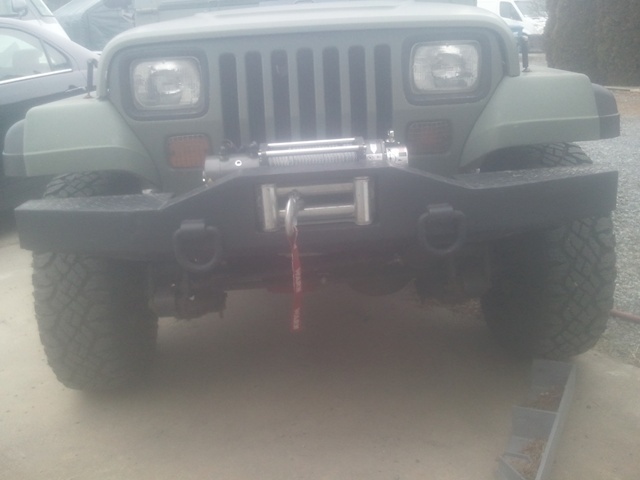 After I designed it, I jumped between building the bumper and the winch mount. 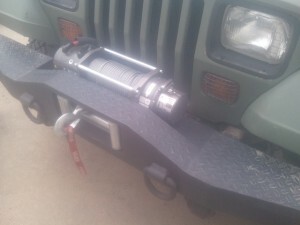 To keep it simple, I will first talk about the winch mount. I made sure that the custom made winch mount would hold up. I started out with a huge piece of angle iron. 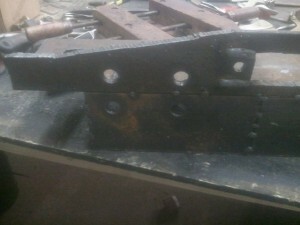 The angle iron was about 2″ high, 8″ wide, and 1/2″ thick. 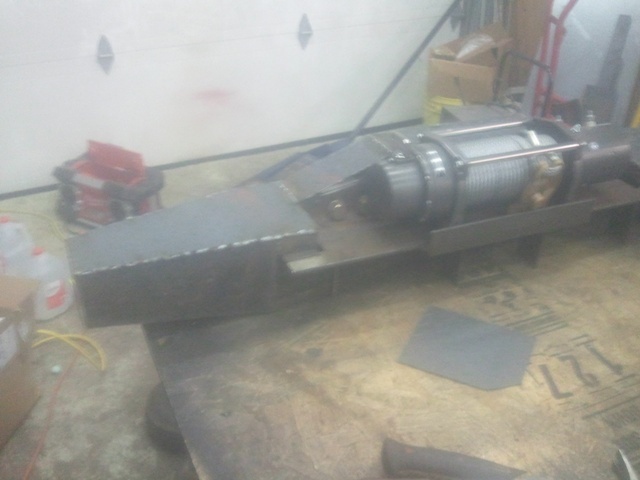 I sure hope my 8,000 pound winch doesn’t bend the steel. 🙂 The steel is going to be welded to my frame. I was originally going to bolt it in; however, this would not have been as strong as welding. The above picture shows just how nuts I am. In the picture, the winch mount is upside down. 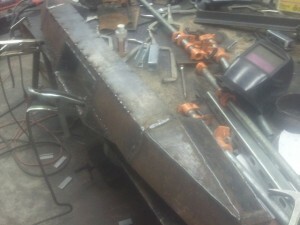 The four pieces of steel coming up will go around a tubular cross member attached to the frame of the Jeep. There is also a piece of angle iron welded to the winch mount. If you look at the picture, it is toward the bottom. Unfortunately, the steel I was using for the winch mount was a little too small, so I used a piece of angle iron to extend it. You may also notice that there are two square holes on either end of the winch mount. 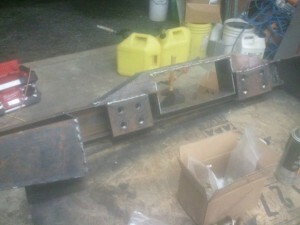 This will give me a little more area to weld the winch mount to the frame. 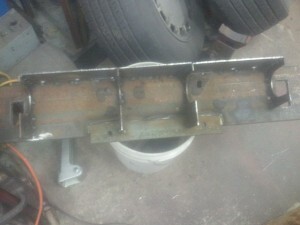 As you can see, there are four holes in front of the winch mount. These holes are for 3/4″ bolts. There are another four on the other end of the mount. This will be used to mount the bumper to the jeep. You can also see two fat welds past the hole for the winch line. This is there because I measured the size of the hole wrong. 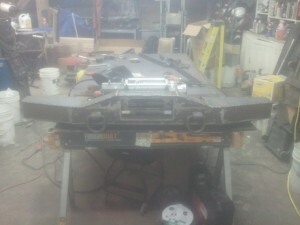 The front area of the bumper is made out of 4″X2″X0.25″ C channel. I chose to counter sink my rollers into the bumper. On top of the C channel are the two endplates. The way I made these endplates is simple. I drew the shape in Cadstd, subtracting the half inch of the plasma cuter tip. After I printed the shape, I traced it onto a piece of wood. Using a jig saw, I cut the piece of wood which gave me a template. I then used a plasma cutter and traced around the wood to get to the final part. I welded two pieces of C channel to the back of the bumper. Inside, there are 3/4 nuts tacked to the inside of the C channel. This does mean that the nuts aren’t serviceable, but that shouldn’t make a difference, right? Any way, you can also see the roller shroud in this picture. This picture shows two things. 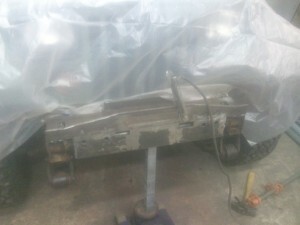 It shows the final shape of the bottom of the bumper. It also shows how messy my table gets. Yikes! 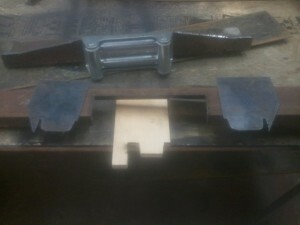 To fix this problem I cut slits into the steal and slid the bolts into place. I then welded the fall off back into place and made it look like nothing happened. 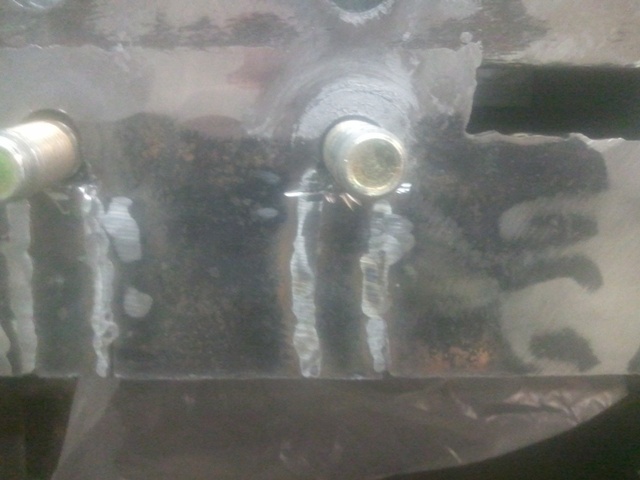 To tighten the pain in the neck lower bolts, I had to grind down an open end wrench. Also, one of the non serviceable nuts popped off, and one of the upper bolts binded and would not tighten fully. Therefore, I only have six 3/4″ bolts holding on the front bumper. I tried to come up with a better solution to mount the front bumper, but nothing I came up with was as strong and simple as this.